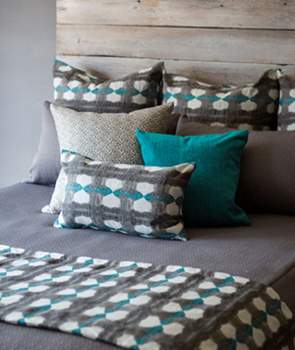 CottonBelle, manufacturers of high-end soft goods, has brought style and comfort to homes for more than 26 years. Owned and continuously operated by two women, CottonBelle is proud to work with some of the best designers and furniture stores from San Francisco to New York City. Situated in the tiny Ozark town of Belle, Missouri, CottonBelle's team gathers during the week to share the week's stories while meticulously stitching accent pillows, covers, draperies, bedding and custom pieces. With an open line of over 450 American-made fabrics, including Sunbrella, CottonBelle remains dedicated to textile design and manufacturing in the USA. We believe that everything in your home should speak volumes about your style and creativity and would love to help your house feel like home. Contact us for a designer or retailer near you.